A little late I know, but I was out of town! Ok, so this is a "not-so-quick" tip. For those looking for the short version, skip down four paragraphs. The rest of you can read on from the beginning to learn the source of the this week's tip. Last month one of our friendly neighborhood game store owners announced a painting challenge: complete a 2000 point, tournament legal army with three objectives and a display board in only 30 days. 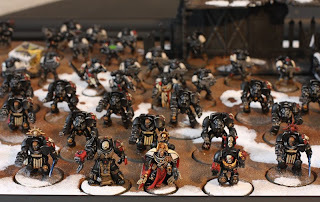 Since I was just about to start my Black Templars Terminator army, and I'd always wanted to do a display board, I threw my hat in the ring. I've done a lot of batch painting before (with Orks, who hasn't? ), but under the the 30 day time pressure, I picked up a few new tips I wanted to share. The most important tip when facing a big project on a short deadline is one you already know: have a plan. In this case, there was no way I would have been able to complete this army in 30 days if I didn't already have an army list, a painting and basing plan and set time goals (do a little every day) so that I could stay on track the whole 30 days. The second tip is also a no-brainer: have everything you need before you begin. Have all of your models, all of your paints, all of your supplies, everything ready! Have it all before you start so that all you have nothing else to do but sit down and work. This also cuts down on the procrastinating ("Oh, if I only had that missing power fist to finish this model...") or those longer than necessary trips to the game store to pick up a few missing items (There is a reason those stores don't have clocks). One of the competitors in the challenge forgot to bring his brushes on his Thanksgiving vacation. But he motored through, found a local hobby store and bought more brushes; now that's dedication! But best new tip I learned painting this army is to record my steps and carefully follow them. I normally dream up a painting scheme and it usually changes as I start painting, and I often find some of my batches have slightly different schemes and sometimes even different colors as I wandered through the process. Since time was short, I actually wrote out each of the steps for painting each model and followed each step squad-by-squad. My plan was actually twenty-one steps to take a primered model to a based and completed one. I only worked on one squad at a time, doing each step to every model in the squad before moving to the next one. I had small squads (and therefore small batches); in this case usually 5 or 6. Carefully following the planned steps also provided a few benefits. First was creating a consistent and even look to the army. I painted all of the powered armor models first, and then the Terminators. Even the injured model in my objective was painted the same way as the normal Marine squads. And the building and other objectives were painted with the same colors and techniques. This systematic painting gave my very consistent results for the army, despite getting better at certain techniques as I went along. Even though I got better at lining sharp edges while painting the Troops, they all look very similar and the later Elite Terminators look even better with my improved skill from painting all those Marines. Secondly, the process created built-in touch up time. This is the best speed-batch thing I learned: as I was working on one squad and noticed a missed color or spot that needed a touch-up, I would mark the base of the model (so I didn't forget!) and continue with the plan, letting the blemish go untouched. When I was working on the next squad and reached the previously botched step, I'd put the touch-up models into the current batch and do the fixes at the same time I was working on the primary painting for the next squad. This way I never had to go back "off the assembly line" and change out my paints and brush, losing working time. I normally just paint batches of troops, and this only really revealed itself when working on batches in a whole army. I am definitely going to use this touch-up technique again for batches, maybe even making a grid on a piece of paper to place models that need certain color touch-ups. In the end everything came together and I found that I had enough time at the end to add a terrain piece to my display board. Following the plan and being consistent helped keep me on track. The store owner explained that part of the challenge was to show that you really can get a lot painted if you set your mind to it. Thirty days wasn't a lot of time and it even fell over the Thanksgiving Holiday, with all of the normal interruptions that can bring. Over twenty people participated in the challenge and five completed the challenge sucessfully. Pictures can be found in the thread on our local forums. Below are a few pictures of my completed army. Congratulations to all the winners and thank you to Brandon at Battleforge Games for sponsoring the Challenge! It is New Year's Resolution time! How many of you have painting resolutions for this year? And, be honest, how many broke their painting resolution from last year? I'm not sure it would be physically possible for a Tyranid player to do that unless they went Nidzilla. What an astonishing feat to take on and accomplish. Kudos! My LGS is doing a Finish and Army Challenge. 3 Blocks of 750 points over a 3 month period. Each month, you bring in the completed block for judging and scoring and then you begin on the next block. Scoring is based on progress from your baseline with awards going to best painted, peoples' choice, and horde and extra points for terrain or themed objective markers. We finished our first block in November with 18 people showing up. I've been (re)learning tons about assembly line painting as I motor though the Finish and Army Challenge and painting up over 100 orks in between Blocks. I think I'm on track to finish 99 Orks and 9 Deffkoptas in this 30 day period. One of the things I've learned is to break figures into discrete little repeatable blocks that can be done quicky. By this, I mean sub steps to a particular color. For example, the AOBR Orks have tons of straps, I separated them into like body types, and then did all of the back straps, then all of the front straps, rinse and repeat with the next block of figures. Not only is this improving my speed, but it makes sure I'm not missing straps that need to be corrected later. Like Grey Death mentioned, if I find a part I missed, I set him off to the side to be addressed later. I intend to write up a Dakka article on this later when I'm done. Just a little reminder, Realgenius wrote the article ^_-, I'm just reposting from our site ^_^! Mattlov wrote: I'm not sure it would be physically possible for a Tyranid player to do that unless they went Nidzilla. Thanks! It definitely helped that the army only had 51 models to paint. But I did wake up a few mornings early and do some painting before work. You have to make the time. Ifurita wrote: One of the things I've learned is to break figures into discrete little repeatable blocks that can be done quicky. By this, I mean sub steps to a particular color. For example, the AOBR Orks have tons of straps, I separated them into like body types, and then did all of the back straps, then all of the front straps, rinse and repeat with the next block of figures. Not only is this improving my speed, but it makes sure I'm not missing straps that need to be corrected later. I really dig this idea. I never thought to do anything like that, and I believe I'll have to bring that into my Ork painting (when I get back around to them x.x....). Wow, nice work. Congratulations on finishing the army!